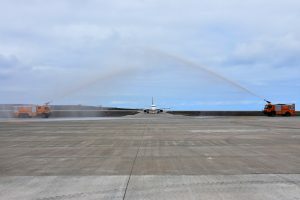 Today began an exciting new chapter in St Helena’s history when the first ever commercial flight from South Africa touched down at St Helena Airport at 1.59pm. 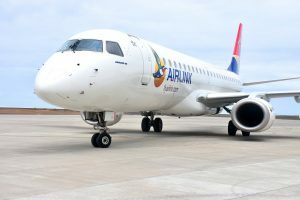 Using their Embraer E190-100IGW aircraft, Airlink brought in this inaugural flight from OR Tambo International Airport in Johannesburg, following a six hour journey incorporating a fuelling stop in Windhoek, Namibia. 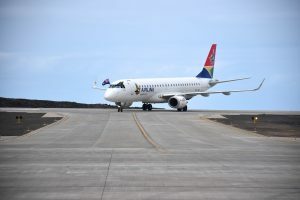 Airlink will now operate a weekly service between St Helena and Johannesburg and St Helena and Cape Town (via the stopover at Windhoek International Airport). 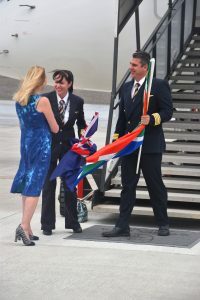 72 passengers comprising returning Saints and invited guests – Tour Operators from Eastcape Tours, Get Africa Travel, Springbok Atlas and Island Holidays, International media – BBC, ITV, The Times, Thomson Reuters, Associated Press and other publications – were greeted by HE Governor Lisa Phillips on arrival and then by a full St Helenian welcome in the packed Arrivals Hall. 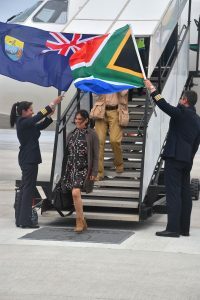 To mark today’s momentous occasion, guests will undertake a full itinerary of visits to key tourist attractions on St Helena. 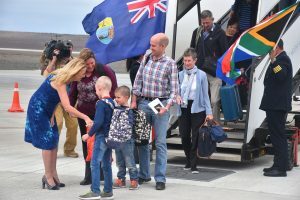 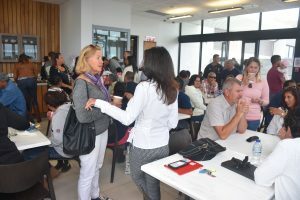 A reception at Plantation House is also being hosted by Governor Lisa Phillips for all passengers onboard today’s flight and for key people involved in the arrangements leading up to today. 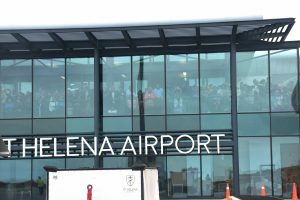 The flight will depart St Helena tomorrow, Sunday 15 October 2017, at 2.30pm. 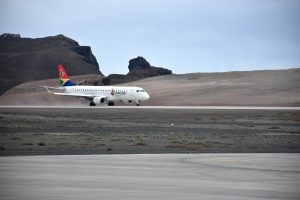 The commencement of a commercial air service is St Helena’s link to the rest of the world and will transform the Island’s tourism industry. 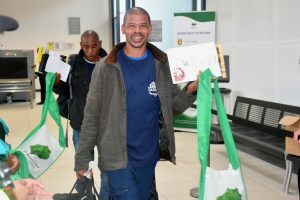 The growth of the tourism industry will have a positive knock-on effect for other sectors including, agriculture, fisheries and construction. 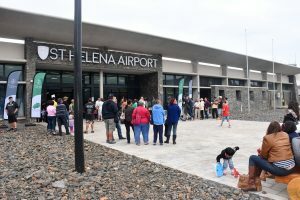 The weekly air service on a Saturday will make it cheaper, quicker and easier to travel to and from St Helena, and will help ensure the Island’s long term prosperity.